We’d love your help. 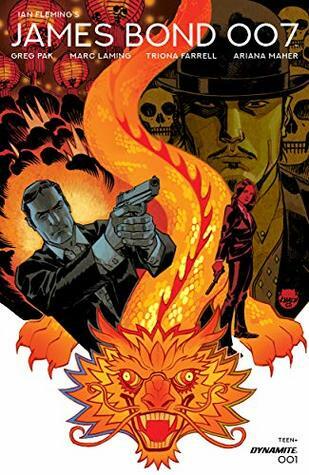 Let us know what’s wrong with this preview of James Bond 007 #1 by Greg Pak. Agent 007 tracks a smuggler into Singapore to secure a dangerous case, contents unknown. But a Korean mystery man wants the case as well, for very different reasons. And if Bond and this new rival don’t kill each ot The ODD JOB epic begins in a new ongoing James Bond comic series by superstars GREG PAK (Planet Hulk, Mech Cadet Yu) and MARC LAMING (Star Wars, Wonder Woman)! To ask other readers questions about James Bond 007 #1, please sign up. Absolutely yes! You know it's a good one when you're disappointed that it's over! Very much looking forward to issue #2. As is somewhat usual for me, my rating for issue #1 is not the same as how I would rate my expectations of the series to follow. In this particular case, the first half or so of the issue was all sorts of action with no context. I find action difficult enough to follow in comic books anyway, but when you combine it with having no context beyond cultural recognition of who James Bond is, it is tedious to me: until I've been delivered into the world, I as a reader want to be spoon-fed. After you'v As is somewhat usual for me, my rating for issue #1 is not the same as how I would rate my expectations of the series to follow. In this particular case, the first half or so of the issue was all sorts of action with no context. I find action difficult enough to follow in comic books anyway, but when you combine it with having no context beyond cultural recognition of who James Bond is, it is tedious to me: until I've been delivered into the world, I as a reader want to be spoon-fed. After you've placed me comfortably, I'm more tolerant of later ambiguity. This issue got off to real good start. Is this unnamed Asian agent who I think he is? Or he is the son of Odd Job? Looks like the start of yet another exciting Bond adventure from Dynamite.